Hello new Al fresco eating area! "The fondest memories are made gathered around a table"
There is nothing nicer than sitting outside in the long evenings having your dinner al fresco style. So, this week's makeover I am going to call "Out of the FIRE and into the SUN"
I really love the red bricks that make up our #courtyard and I knew instantly when we moved in that it had great potential to be a lovely #eatingarea. The only thing stopping it becoming a nice area was a huge oil tank that was not only terrible to look at but also took up lots of space. It's safe to say I hated it from DAY 1 and it had to go! Step 1: Removing the oil tank was a big job for the plumbers as they had to use an angle grinder and chop it into lots of different pieces because it was too heavy to lift as one piece. Step 2: Put in a new oil tank. We were lucky enough that there was an area close to the original tank to put the new one and what was even better, it was hidden out of site. Step 3: Once the new tank was in place we had to get rid of the breeze blocks that the old tank sat on. (I have to admit this was a tough job, so I had to call in the BIG GUN AKA Seamus to give me a hand). 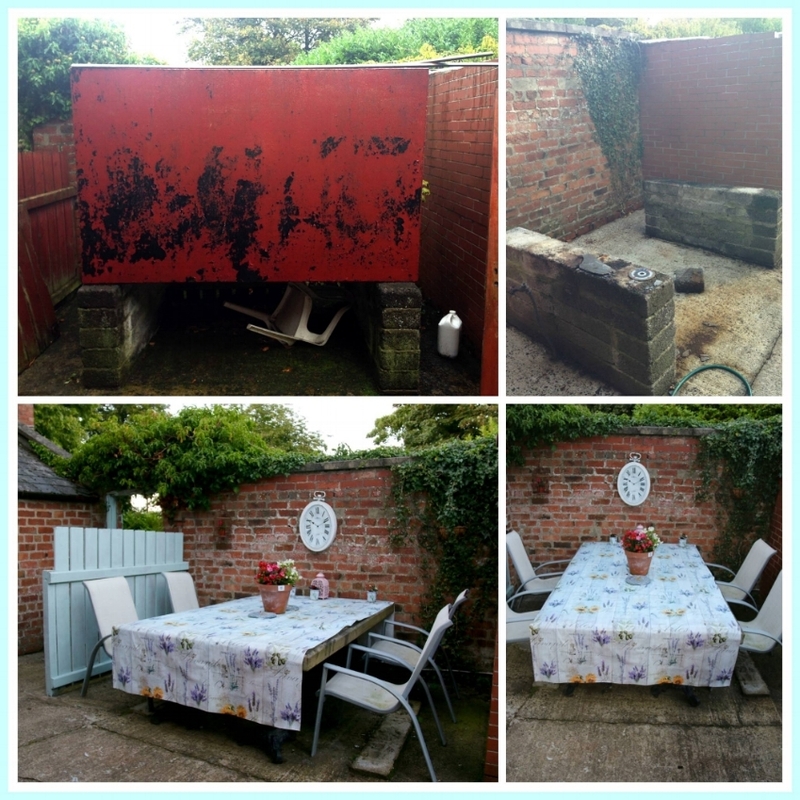 Step 4: With the tank no longer taking up the whole courtyard, it was time for me to give it a Dream DIY transformation. I replaced the tank with a lovely wooden garden table, along with a few chairs, an outside clock, a little bird cage and some flowers the area is now ready for us to start entertaining and hopefully make a few new memories along the way!